I am not going to lie, the past 2 days I have been SCRAMBLING. This summer has been full of surprises and I haven’t had a ton of time to work. When I do it’s fast and furious and I’m going through the motions of a crazy lady. For instance, I came home from Houston, where I would have spent only 1 night but wound up staying 4 instead. That left me with 2.5 days to do 2 weeks worth of work and, guess what? It didn’t happen. In my rush I decided that I wanted something familiar, comforting to eat and I was going to make some “orange stuff” my momma makes but I forgot the cottage cheese and Cool Whip. Since I’ve been on an ice cream kick, I decided to turn it into something a bit cooler and creamier and boy, oh boy is it GOOD. 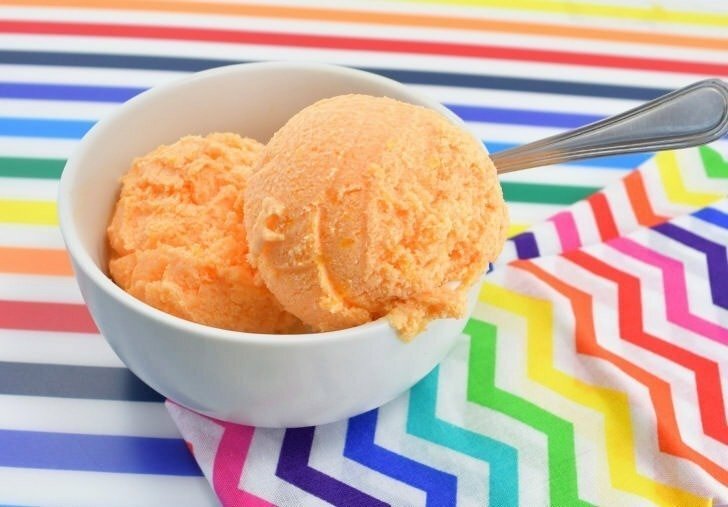 Now this isn’t a natural mandarin orange ice cream flavor because we use orange flavored gelatin to carry the bulk of the flavor load, but it’s still super good. Perhaps I’ll work something out some day with juice and more real fruit but for now, I’m ALL about this business and I hope you enjoy it as much as I do! 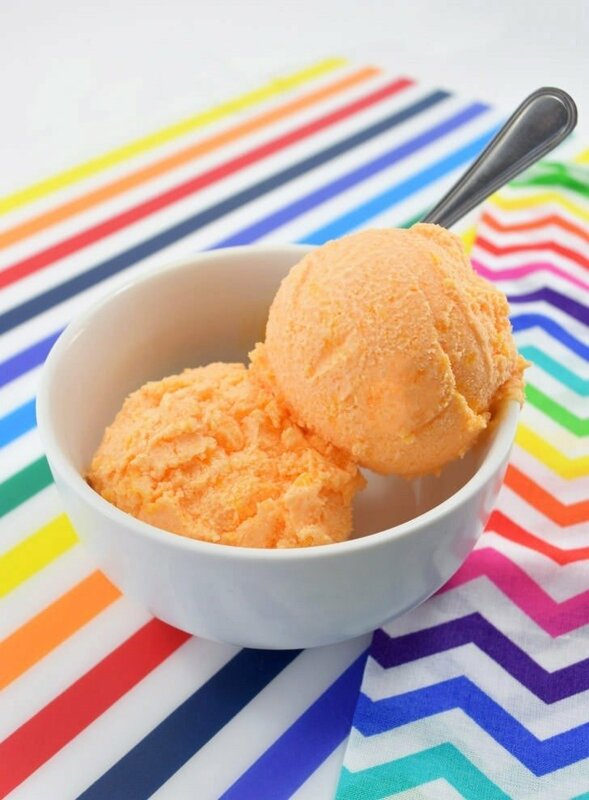 Taking a cue from one of my favorite recipes from my Momma, I’ve turned her “Orange Stuff”, a type of fluff salad, into ice cream. 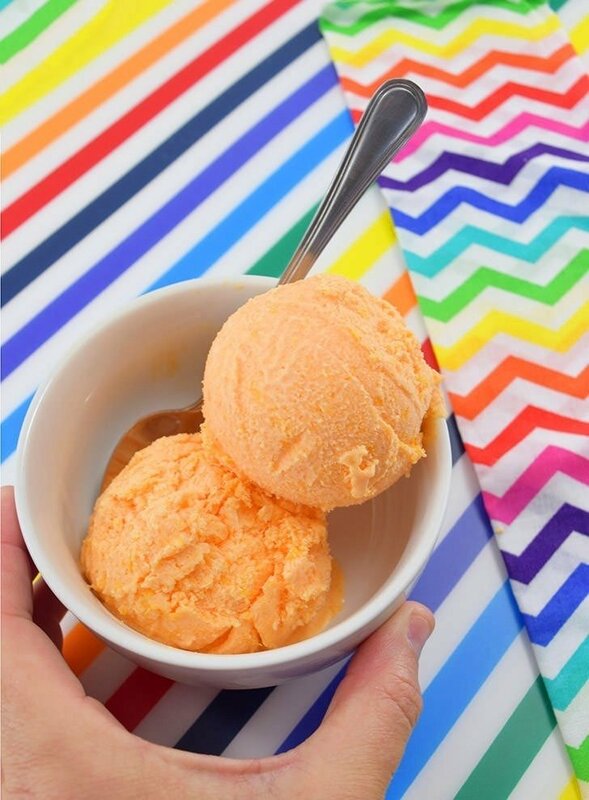 Sweet, creamy with a little bit of a tang, this ice cream hits the spot on a hot summer day! In a stand mixer or with hand beaters combine heavy cream, Jello mix, sweetened condensed milk and lemon juice. Beat until soft peaks begin to form. Pour into a rubber container. Seal the container and allow to freeze 4-6 hours, though overnight is best.